This month with Allrecipes we are working with Reynolds Foil a product that I use just about every day in my kitchen. It is also a product that goes way beyond just covering dishes and wrapping up leftovers. Reynolds Foil is perfect for using when you are having a BBQ. You can use it for every part of your meal from preparation,cooking and clean up! 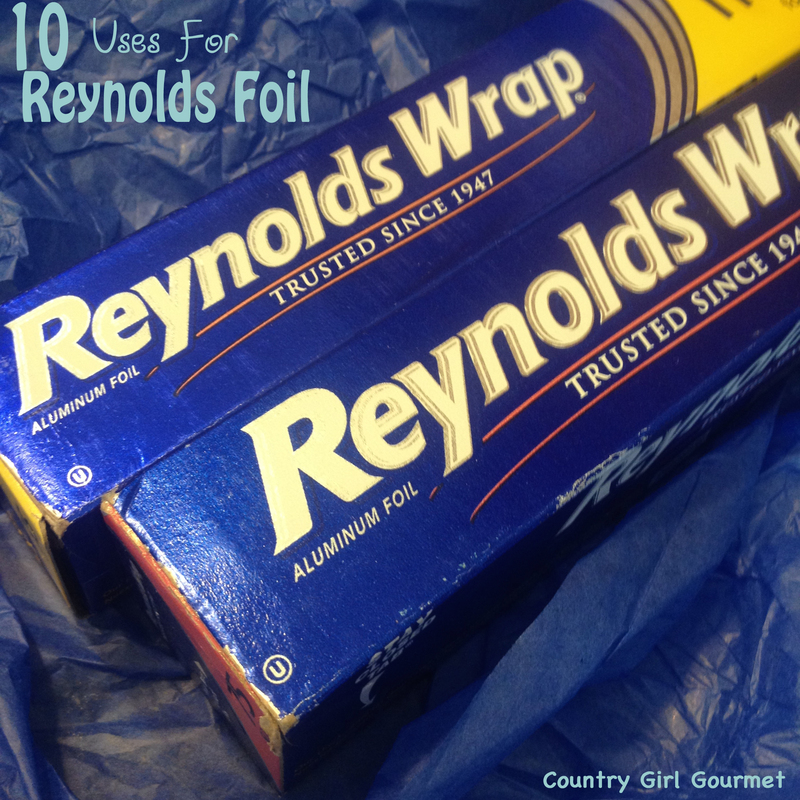 Today I want to share 10 of my favorite tips for using Reynolds Foil to make your next BBQ a knock out! As a added bonus I am throwing in a salmon recipe that my husband and second son really love. Are you making BBQ Chicken or Fish? Hate how it sticks to the grates on your grill? When grilling line your grill with Reynolds foil to help prevent sticking. Just poke a few holes in the foil to drain juices. Want to grill some shrimp or veggies but you don’t have any kabob skewers or a grill basket? Just use foil! It will keep your food from falling through your grill grates. I’ve even known people that use this method to make bacon on their grill for bacon cheeseburgers! There are so many things you can make in foil packets. The possibilities are endless and delicious! Foil packets are simple and easy to make too. All you need to do is, place food on the center of two layers of foil Next top with your desired seasonings and oil. Finally bring the two long sides together, fold foil over the food. Fold over three or more times. Fold and crimp remaining sides and then grill as directed. Then clean up is easy peasy. Check out the recipe I have below for Salmon. I have issues making fish but with foil packets I can make it easily for my husband and son. If you need to keep food warm until serving time cover with some Reynolds Foil until serving time. The foil is also perfect for wrapping meats that need to rest before serving like brisket. Line baking pans and cookie sheets with aluminum foil to cut your cleanup later. This tip is perfect for times where you are making a bunch of burgers to grill. Just cover a tray with foil and discard once the burgers are on the grill. Your serving tray will still be clean for your cooked burgers. Want to use your grill but it is a dirty mess? Use Aluminum Foil to clean your grill without chemicals. Just ball up a piece of foil and use tongs to clean the grill grates. Want to transfer your favorite condiments into a different container for your BBQ but you don’t have a funnel? Make one with Reynolds foil! All you need to do is take a piece of foil and make it a cone shape with an opening at the pointy end. Secure it with a piece of tape and then you are ready to pour and transfer your favorite condiments. Making a classic apple pie for dessert for your BBQ? Another favorite Reynolds Foil use of mine is the pie crust protector. To prevent burnt pie crust edges, crimp foil around the edges prior to placing the pie in the oven. ]s can help you there also! Use Reynolds Foil to scrub off baked on food instead of using steel wool. If you have food stuck to your baking dish or frying pan, wad a clean piece of foil into a ball, then use it with few drops of dishwashing liquid to scrub glass cookware clean. Now here is the Salmon recipe I was talking about above. When I was a kid I had food poisoning from fish and since I have not been able to eat or really cook seafood but with foil packets I was able to easily make this for my husband and son. They loved the salmon this way! Thaw fish if frozen. Rinse and pat dry with paper towels. Preheat grill to medium-high. Tear off an 18×18-inch sheet of Reynolds Wrap® Heavy Duty Aluminum Foil. Place onion in the center of the sheet. Top with salmon. Drizzle with the olive oil and sprinkle with the salt and black pepper. Top with lemon slices. Bring up foil sides. Double-fold top and ends to seal packet, leaving room for heat circulation inside. Stack flatbreads; wrap tightly in heavy duty aluminum foil. Grill salmon packet over medium-high heat in covered grill 12 to 14 minutes or until fish begins to flake when tested with a fork and vegetables are tender. Add the flatbread packet to the grill for the last 5 minutes of cooking to warm through, turning once. Remove all from grill. Open packets carefully by cutting along top folds with a sharp knife, allowing steam to escape. Then open top of foil. Discard lemon slices. Use two forks to pull the salmon apart into chunks. 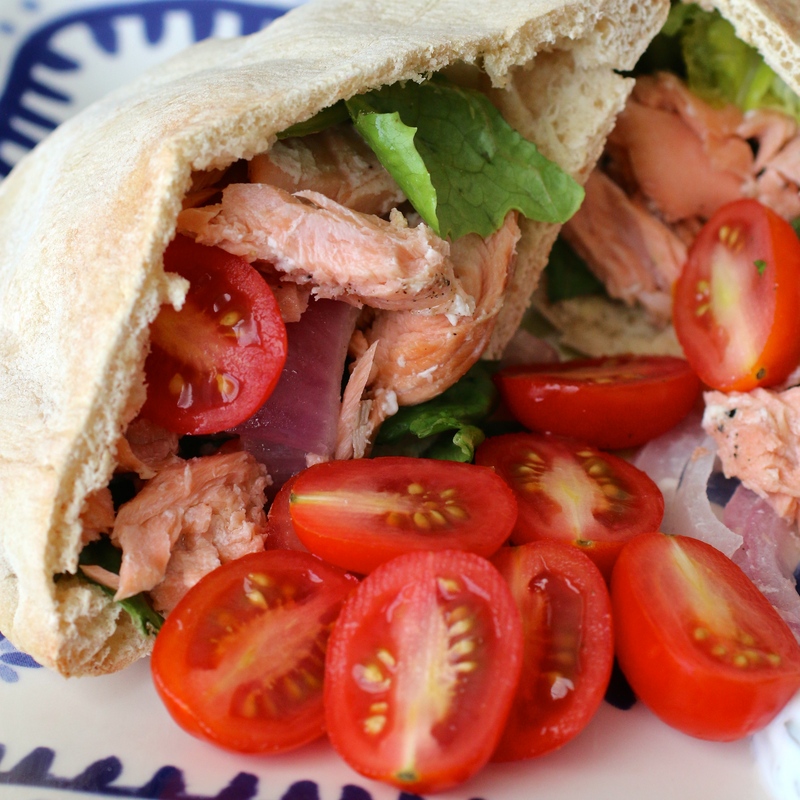 Assemble pita sandwiches by topping with the salmon, onions, lettuce, and tomatoes. Fold in half to serve. In a small bowl, mix together the yogurt, basil, and dill. 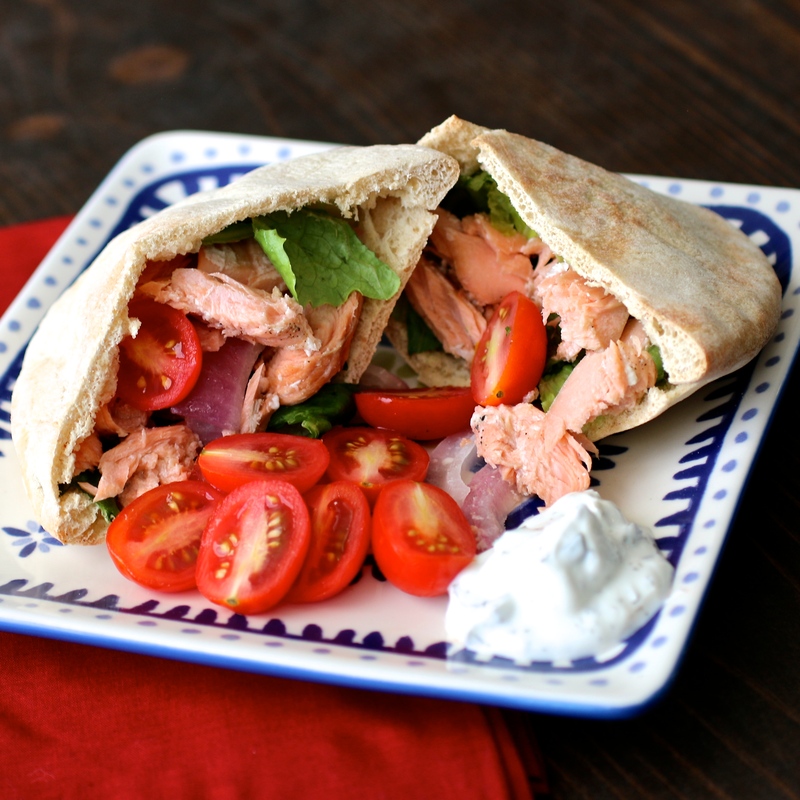 Serve over pita sandwiches. Looking for more great Reynolds recipes? Check out their webpage.